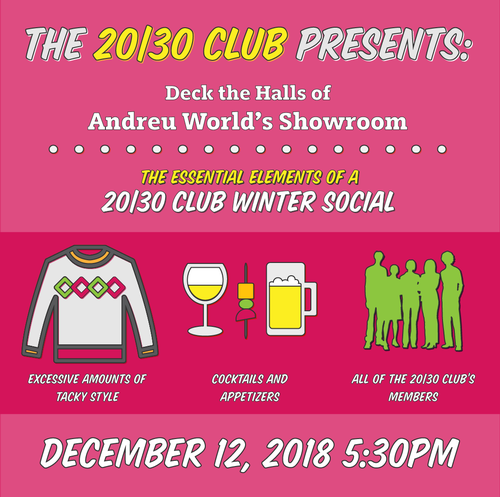 Join The 20|30 Club for a fun and informal Holiday Social! Ugly Sweaters are optional... however if you wear your tackiest, ugliest, gaudiest sweater you will have a chance to win fun prizes! The 20|30 Club provides emerging AEC leaders and their peers with casual, educational and fun events for building professional relationships. 100% of our proceeds from these events provide annual scholarships to college students pursuing an acceredited degree in the AEC industry. Note: If your company has a Corporate Level Membership or higher, you will receive member pricing.